Do objective moral values really exist? In this featured article, apologist Neil Shenvi argues that objective moral values do indeed exist. 1. What are "objective moral values?" 3. Do moral relativists really exist? 4. Why are we moral relativists? I highly recommend this excellent article found here. For more articles and resources from Mr. Shenvi, see here. 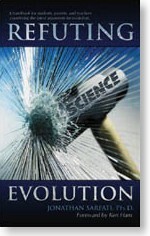 I received an informative, short read from a coworker entitled Refuting Evolution by Dr. Jonathan Sarfati. He wrote it as a response to The National Academy of Sciences' (NAS) Teaching about Evolution and the Nature of Science. The NAS points to examples such as the resistance of bacteria to antibiotics and the Galapagos finches as evidence for evolution. However, Sarfati notes that these examples are all losses of information. So, he asks, how does evolution explain an increase in information of 482 genes making up 580,000 base pairs in the Mycoplasma genitalium, the smallest known genome of any free-living organism, to 3 billion base pairs in humans? Refuting Evolution by Jonathan Sarfati is available for free in our Free Apologetics E-book Library located here. 1. Jonathan Sarfati, Refuting Evolution, p. 126. I have consistently put forth what I believe to be a very strong argument for the existence of a personal God and the reality of personal guilt before God based on the existence of self-evident moral rules in the universe. I think it's a good argument. But it hasn't gone unchallenged, especially by those who are committed to the belief that nothing truly exists which is not subject to examination by the senses through scientific inquiry. This idea has been around in some form for a long time and goes by a variety of different names, depending upon how it's nuanced: physicalism, scientism, anti-realism, nominalism, strict empiricism, naturalism, etc. I think it's safe to say that modern man thinks he believes this. (Shannon) But this man who said knowledge was only available through empirical testing also said he'd been in love many times, and you can't put love in a test tube. Further, you can't weigh this empirical knowledge he was referring to. And the more we talked the more it became evident that we couldn't even discuss the issue without having to employ the very abstract entities he claimed didn't exist. By the way, virtually everything we hold to be dear and important to us....cannot be analyzed empirically. If this is true, and if it's also true that nothing is real that is not available to scientific scrutiny, then nothing truly important to us actually exists. A recent challenge to the transcendent nature of morality comes from the book The Moral Animal--Why We Are the Way We Are: The New Science of Evolutionary Psychology , by Robert Wright, published by Pantheon Press. I have not read the book, but I have read the review by Sara Lippincott in the September 4 (1994) Book Review section of the LA Times . Lippencott sketches out the arguments for us. The thesis: "conscience, the seat of our moral sense, evolved as a survival mechanism. When...we feel guilt because we have harmed a sibling, it is because we have thereby imperiled the proliferation of our genes. When we feel guilt because we have harmed someone outside the family circle, it is because we have potentially damaged our own (survival enhancing) status." This doesn't account for guilt we may feel for wantonly mistreating some other animal, which is an immediate problem with this view as an explanation for morality, but let's ignore that for a moment because something else is more pressing. If everything about man can be explained in scientific, evolutionary terms, Our belief that we're exploring truth is merely the result of our physical wiring over which we have no control. This explanation implicitly contains a remarkable claim. It suggests that there is something in us that is self-consciously aware of the process of evolution, that understands what the goal of evolution is--survival of our own species--and instructs us through our conscience to fulfill the optimal conditions for that survival. How do we know that harming a sibling has "imperiled the proliferation of our genes?" Isn't this a remarkable statement? Nobody even knew what genes were until Gregor Mendel in the latter part of the 19th century. Consider two cavemen in neighboring villages. One kills the other in cold blood. We're being asked to believe that he feels guilt because he realizes such an act ultimately undermines his own survival status (How? He didn't say.) In the rest of the animal kingdom, killing the opposition seems to secure just the opposite. We think we have a type of transcendent knowledge we call morality, Wright argues. But there's an explanation for that in evolutionary terms. Something in us knows that conscience is useful for securing the long-term survival of our race. So now to explain away the existence of morality as transcendent knowledge Wright posits the existence of some other kind of transcendent knowledge that creates morality for its own purpose. But this only pushes the problem one generation back. 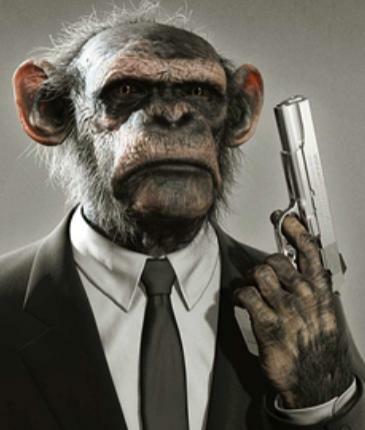 One can then ask, "Where did this force, this law, to always seek the survival of the species come from?" You can't say it evolved, because that would be begging the question: Where did the impulse to seek your own species' survival come from? It evolved based on a species seeking its own survival. The argument becomes circular. Wright solves nothing with his amazing claim. There are more problems with this, of course, and they center around one inescapable observation. If everything about man can be explained in scientific, evolutionary terms, Our belief that we're exploring truth is merely the result of our physical wiring over which we have no control. In other words, this kind of physicalism always seems to lead to some kind of determinism: Everything about us is determined by our prior physical states. It's very hard to argue, then, that there is any truth at all to be known, moral or otherwise. If the moral element is prior to the behavior, then it can't be the behavior itself. Then why should I believe this article? This article purports to tell us something true about the universe, but in the process tells us that our perception of truth is something that is dictated by our genes to "get our genes into the next generation." This view changes drastically what it means to be moral. It reduces morality to mere survival, to pragmatics. We feel moral urgings because these moral urgings help us to survive better. They have at their core self-preservation in mind. But does self-preservation truly capture what we mean when we say a thing is moral. Indeed many things that fall into the moral category have to do with denying self. But what is this "correct" business? It implies that there is some higher standard outside of the morality that he is allegedly explaining, a higher standard of moral conduct that can correct the "moral biases built into us by natural selection." But it's precisely this higher moral law that needs explaining and defies naturalistic explanation. Robert Wright doesn't explain it. He merely offers an explanation for some low order moral conduct that has survival value. And then cavalierly refers to this other morality that enables us to become "a truly moral animal." He writes, "Go above and beyond the call of smoothly functioning conscience; help those who aren't likely to help those in return, and do so when nobody's watching. This is one way to be a truly moral animal." Arguably, certain ways of acting may have evolved (I don't believe this, but I'll grant this for the sake of argument), but morality is not merely a way of acting. How do I know this? Because there's an oughtness about behavior that we can feel that actually precedes the behavior itself. It's not a behavior pattern, but an internal compulsion that compels us to choose certain behaviors--to do what's right--even though this moral incumbency can be denied or disobeyed. If the moral element is prior to the behavior, then it can't be the behavior itself. For more excellent resources from Greg Koukl and Stand to Reason, go here. Faith Facts is a great resource dealing with various apologetic topics. One of the resources they offer is a great acronym to help remember some of the evidence for the trustworthiness of the Bible. For more great resources, check out Faith Facts here.